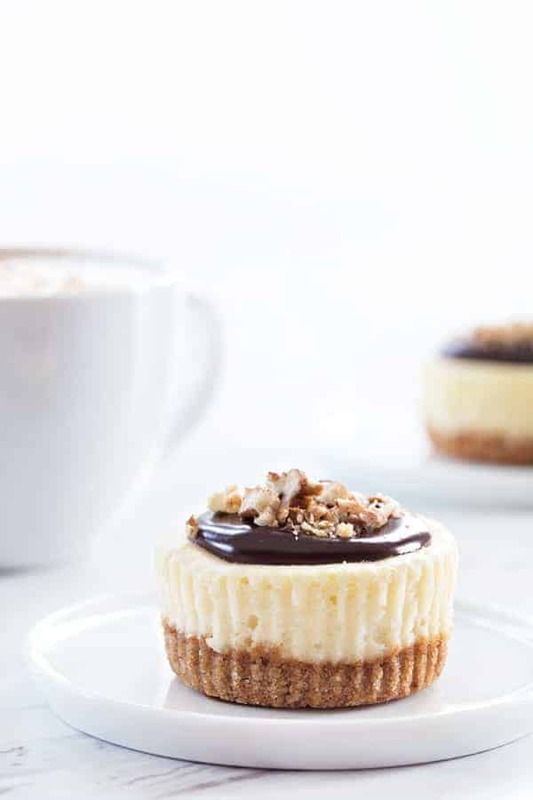 Mini Chocolate Pecan Cheesecakes will cure any nutty chocolate craving you’ve got going on. They’re perfect for your next dinner party, too. Oh man. You guys know my obsession with cheesecake. I don’t make it a secret, that’s for sure. But it’s been a while since I’ve made one. Like, a reallllllly long time. All the way back to June of last year, I think! I thought surely that couldn’t be right, but it is, according to the archives. Crazy. So baby girl and I decided we were way, way overdue for some cheesecake goodness. 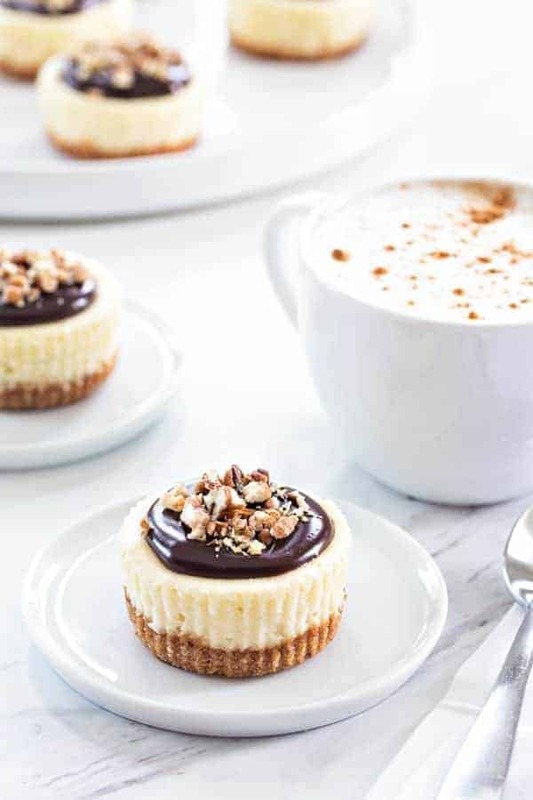 Enter Mini Chocolate Pecan Cheesecakes. Hello, gorgeous. I adapted a recipe I found on the Karo® Syrup site that intrigued me. It’s got your classic graham cracker crust, with some extra flavor and texture provided by delicious Fisher Nuts (the original called for almonds, I went with pecans, because I love them to the moon and back). And the cheesecake filling itself is made with Karo® Syrup, to ensure a smooth texture and just the right amount of sweetness. Because I can never leave well enough alone, I left the cherry pie filling in the cupboard, and decided we’re getting hot and heavy with homemade chocolate ganache instead. I have a feeling you support me in this plan. Yes? Homemade chocolate ganache is SO easy to make. All you need is chocolate, heavy whipping cream, a splash of vanilla, and a little more Karo® Syrup. The syrup makes the ganache smooth, and it’ll perfectly glisten on top of your mini cheesecakes. It also provides the perfect landing pad for more chopped pecans. Because pecans. Can you tell I love them almost as much as cheesecake? You could probably make a big ol’ single cheesecake with this same recipe, but I haven’t tried it. If it’s mini, I’m enamored, so yeah.. I wasn’t going to mess with that part of the original recipe. Portion control. Because I have no self control, where cheesecake is involved. You know this. Quick baking time – they’re done in just 15 minutes! Quick cooling time – you can be eating these bad boys after just one hour in the refrigerator to chill. Duh. Everything is cuter when it’s mini. So who’s with me? 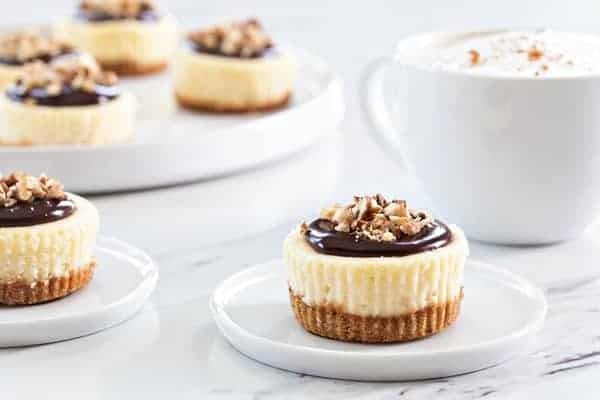 Ready to make some adorable Mini Chocolate Pecan Cheesecakes? You don’t need a reason, other than it’s still winter, many of us still have snow, and cheesecake. Cheesecake can very much be a reason. 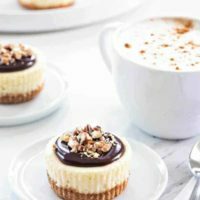 Be sure to bake a little extra for your valentines too because these Mini Chocolate Pecan Cheesecakes are sure to disappear in no time! Looking for more delicious desserts for your Valentine? Be sure to check out these Chocolate Salted Caramel Scotcheroos and these Cherry Cheesecake Crumb Bars! If you’re looking for a low-carb treat, this Low Carb Cheesecake is amazing. Preheat oven to 350˚F. Line muffin tins with paper cupcake liners. Place graham cracker pieces and pecans into the bowl of a food processor fit with metal blade. Pulse until they form a fine crumb. Add 2 tablespoons sugar and butter and pulse until all the ingredients are evenly distributed. Place a heaping tablespoon of the crumb mixture in the bottom of each baking cup. Press gently to form an even crust. Bake crusts in preheated oven for 10 minutes. Place pan on wire rack to cool while you prepare the filling. Beat cream cheese, remaining 2 tablespoons sugar and cornstarch in the large bowl of an electric mixer until well mixed. Add egg and blend well. Add corn syrup and vanilla. Beat until just blended. Pour filling into baking cups, dividing evenly. Bake for 15 minutes or until just set. Chill for 1 hour. Once your cheesecakes are completely chilled, prepare the ganache. In a small saucepan over medium heat, warm the heavy cream until very hot, but not boiling. Place chocolate pieces into a heat safe bowl. Pour the hot cream over the chocolate and allow it to sit for about 5 minutes. Whisk the cream and chocolate until smooth and thoroughly combined. Whisk in the corn syrup, and vanilla. Allow it to cool for about 5 minutes. Do not let the glaze sit for too long or it will harden up before you spoon it onto the cheesecakes. Spoon the glaze into the center of each cheesecake and top with more chopped pecans. Return the cheesecakes to the refrigerator until you are ready to serve. Stunning photos! and the cheesecakes look sooooo good! I need clarification. You said to line the muffin cups with metal liners. What are metal liners? My muffin cups are silicone and my liners are paper. Where do i get metal liners? You can use the foil liners. Or any other liners will work! Let me know if I can help with anything else! Did you remove the cupcake liners? According to the picture it doesn’t appear that they are sitting in liners, it looked like they were removed before serving?. Yes, they were removed before serving. Let me know if you need anything else! These get an official “hooray” from me!! I love pecans and I love cheesecake. Better together, united with chocolate! Yummy in my tummy tasty delight!!! A delish treat of so mmmm!!! I want one now!!! I hope you like them, Jana! Well, don’t these just look delicious, and perfect, and…I think I need them in my life immediately! Holy perfection. These look SO stinkin delicious! LOVE that perfect little pool of chocolate on top. Definitely putting these on my to-do list! Did you use a regular muffin pan? Hi, Ellen! Yes, I use a regular muffin pan. I hope you like them! They look delicious! I’d love to try to make them, but I live in Europe and can’t get all the ingredients. We don’t have Graham crackers here, so I’d like to substitute them with Belgian Speculoos cookies. Could you please tell me how many grams or tablespoons 3 whole Graham represents? Hi, Elizabeth! I believe one full graham cracker weighs 14 grams, so three would be 42 grahams. I hope this helps! Do you think these would be ok to freeze to have in hand for later? Hi, Samantha! I think you could freeze these. I would suggest freezing them without the ganache and garnish and putting those things on right before you serve. I hope you like them! Hi Cristina! Yes, it can be doubled. I hope you enjoy it! I don’t think I can get Karo Syrup brand here in Canada, can you use regular corn syrup instead? Oh and btw I made your Reeses Whoopie Pies with the chips in the batter and people went crazy for them! Hi, Marcy! Regular corn syrup will work just fine. I’m so glad everyone enjoyed the Whoopie Pies! Hi Jamie, Love your blog, photos and recipes — very inspiring! These mini cheesecakes are divine. The baked-in pecans push them right over the top, from Good Cheesecake to GREAT Cheesecake. I shared your recipe in my own blog. I made them in miniature muffin tins, and it was hard to eat just one (or two). Wonderful, Jamie! Thank you for the share! I hope you enjoy it, Brenda! 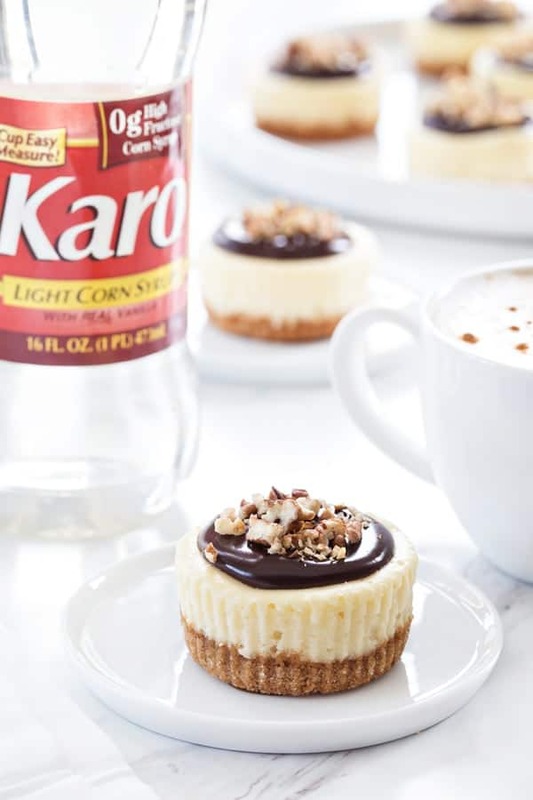 I’ve made a lot of cheesecakes in my day, but I never used Karo syrup before. Definitely have to give these a try!! Looks delish!! Please clarify….mini or regular cupcake pan….thanks! You will use a standard muffin tin, not mini. Thanks! Do u use mini muffin pan or a regular muffin pan? You’ll want to use a standard size muffin tin. I hope this helps. Hi Leo – You could use any kind of pie filling or fruit topping you like, like I did with the Mini Cherry Almond Cheesecakes. Or, you could top them with your favorite caramel sauce. The sky’s the limit! Happy baking.